This book is either middle grade or tween. The story centers on Sophronia Temminnick, a precocious 14 y/o girl in this alt/historical steampunk novel. It's 1850's England with vampires and werewolves an established part of this world. All families employ mechanicals--clockwork servants who help run their homes, etc. Sophronia is taken as a "covert" recruit to Mlle. Geraldine's Finishing School as her mother is quite overwrought caring for this youngest daughter who has no compunctions about climbing trees, rocks, or buildings or taking apart the household mechanicals. En route to her new school, Sophronia meets Dimity (another recruit) and her younger brother Pillover (who will attend the neighboring for boys). She soon learns, when their carriage is beset by flywaymen demanding a "prototype" that Mlle. Geraldine isn't on the regular with this finihsing school. No, in fact, "Mlle. Geraldine" turns out to be a fourth year student named Monique, who had been sent in disguise to collect recruits and some mysterious "Prototype" as her final assignment of school. As she failed, quite spectacularly, Monique is promptly demoted to debut status--same as Sophronia and Dimity. Over the course of the next few months, Sophronia endeavors to lean all she can in both etiquette, and espionage. Her teachers are clearly involved in something fishy--and as Sophronia unravels the prototype mystery she does make some unlikely allies, and distinguishes herself as a prime recruit. It's a fun read, although I wonder if the target audience will love it as much as I did. "Had to leave it behind with the flywaymen." "You did? Oh, yes, you did, didn't you? How tiresome." "When I was driving the carriage." When YOU were driving the carriage? I thought Miss Pelouse said..." A short pause. "Where was Miss Pelouse during all of this?" "Either fainted in the road or crying in th carriage, depending upon which point of the story." The schedule proceeded much of a pace after teh chaos of that first day. Sophronia came to expect the un-finishing-school aspects of Mlle. Geraldine's. The lessons were mostly un-lesson-like, the teachers were mainly un-teacher-like, and the routine was more that of a London dandy than that of any proper educational system. Sophronia's under-petticoat was of good-quality horsehair, thick and very durable. It should be; it was a hand-me-down that had survived three sisters before her. But the werewolf, with supernatural strength, tore through the thick fabric as if it were fine muslin. Captain Niall wrestled with the garmetn briefly before shaking himself loose from the tatters. He crouched down and leapt for Sophronia again. Sophronia angled her bottom around and swung the rope ladder to one side, avoiding the werewolf by the narrowest of margins. "Captain Niall," she said between pants, "I liked your very much better when you weren't trying to kill me!" I love steampunk, and this one was chock full of mechanicals and technology. The entire school floats on steam power and airdinghy-riding flywaymen prove to be a scourge the school must fight off more than once--to protect the prototype. I received a copy of this book via NetGalley. This is my honest review. 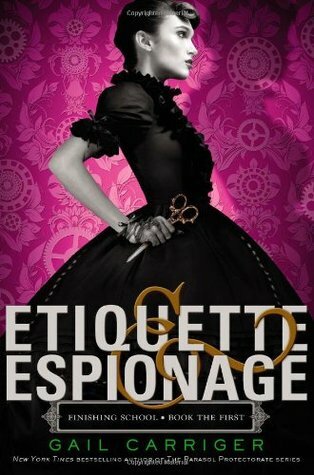 Sign into Goodreads to see if any of your friends have read Etiquette and Espionage.